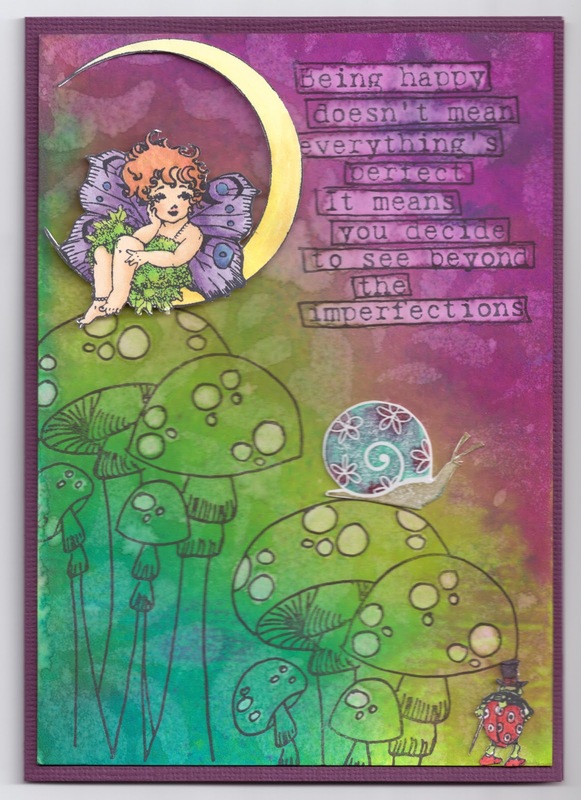 At the recent Scrapbooking Expo in Brisbane I did a class using the Lindy's Stamp Gang and Dylusions sprays. Our teacher was the extremely talented Kate Palmer Sparkle Tart. Kate has loads of great videos on youtube, showing a range of so many wonderful techniques, definitely worth a visit or 10. I had a ball in the class and got very messy. The background to the card below was one of the techniques using the Dylusion sprays, making a watermark using a stencil, stamping and "bleaching" the dyes using water. 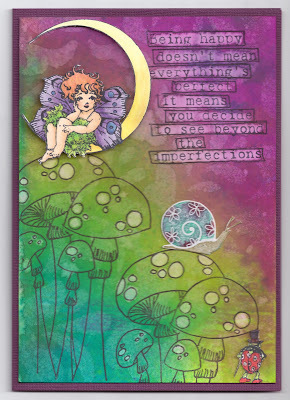 The cute mushrooms on the background are Dyan Reaveley "Dylusions" stamps. The little fairy and the lady(or man in this case)beetle are both Crafty Secrets and coloured with copics. The snail is Inkadinkado and was stamped by colouring Marvy markers directly on the stamp, huffing and stamping. I absolutely love the bright clear colours the dylusions give, they're gorgeous. WOW! Awesome work and fantastic sentiment, thanks for joining us at Crafty Sentiments this week. Stunning card Linda, perfect for our challenge. Thanks for joining us at Crafty Sentiments. Wooow! Your card is stunning!!!! Love those bright colors, really gorgeous! Thank you for joining us at Crafty Sentiments Designs this week and good luck with the draw! Hi Linda! Wow this is a great project. I'm trying to get up the nerve to jump into mixed media art. I like the wonderful mix of colors and the awesome stamping you used on this. :-) Hugs! What cool background work! Looks absolutely amazing. First of all I would like to say massive Thank You for voting for my card at Fashionista's challenge blog. It is very much appreciated!! Loving your amazing card! It is just stunning work! what a colorful card. really like it. thanks for visiting my blog and good luck in MFP drawing for stamp set. wow. This card is amazing. So pretty colours. Wow this is stunning, I love it. I stopped by to say thank you so much for voting for my card over at The Fashionista Challenge, I really appreciate you taking the time to do so. I'm really glad I did pop over as you have some gorgeous makes. I'm going to have bit of a wander around your blog. Absolutely wonderful! LOVE your bg and especially with those mushrooms, it's perfect! 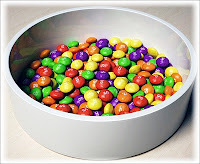 I'm heading over to check out Kates blog!